Is it Feasible to Recycle Concrete in Commercial and Industrial Demolition? Looking around the modern American city or factory, it’s hard to imagine the tons of concrete and steel surrounding you being used in another project one day. Yet this is exactly what is done in progressive building demolition. Oregon to Ohio, we must consider how today’s buildings may be repurposed in tomorrow’s developments. By reusing concrete, we can decrease our need to mine virgin materials. The following examines how concrete is recycled, where recycled concrete may be used, and why it’s important for concrete demolition contractors to recycle. Finally, we’ll describe our own award-winning approach to concrete recycling. Demolition contractors can tell you that building demolition projects almost always produce an enormous pile of concrete – thousands of tons of concrete may be contained in one office building or chemical plant. There are two ways to process this concrete: It may be shipped off site to a processing center, or it may be crushed on site. We prefer the second approach, since it saves money on transportation. Concrete is obviously a very heavy material; shipping it to processing centers requires plenty of fuel. Those Co2 emissions can be avoided with on-site concrete crushing and recycling. To recycle concrete on site, concrete demolition companies must use specialized equipment. Here at Elder Demolition, we use a 428 Trackpactor as our primary concrete demolition tool. Many contractors prefer gravel that has been recycled from concrete structures. Recycled concrete aggregate often performs better than virgin gravel in asphalt and concrete products. Recycling in concrete demolition is extremely important from an ecological standpoint. 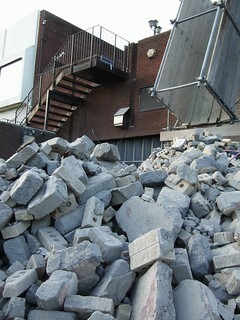 Demolished concrete is a valuable resource contractors can use in many different ways for new projects. Rather than extracting gravel from the earth, construction projects can make use of concrete recycled from previously standing structures. This cuts fuel emissions that would otherwise be required to transport concrete to processing plants. Over 140 million tons of concrete are recycled in the United States every year – and we’re doing our part to send that number even higher. Elder Demolition is an award-winning industry leader in the salvage and recycling of all demolition materials, including concrete. Demolition contractors such as Elder Demolition savor our contribution to environmental stewardship. We offer concrete crushing and recycling in both commercial and industrial settings across multiple states. When it comes to earth-friendly, cutting-edge building demolition, Oregon, California and Washington project managers have a clear choice: Elder Demolition. This entry was posted in Commercial Demolition, Concrete Crushing & Recycling, Green Demolition and tagged building demolition oregon, concrete demolition, concrete demolition contractors. Bookmark the permalink.